New figures from the California Association of Realtors confirm that the region’s real estate markets continue to grow at a robust pace, with double-digit increases in July home prices in all nine Bay Area counties and solid sales growth in all but two. The median sales price of existing, single-family homes in the Bay Area reached $720,000 in July, up 24.2 percent from a year ago. The median marks the midpoint in the range of home prices. In Marin County, the median sales price in July held steady at $1 million, up 18.2 percent from a year earlier and the highest in the Bay Area. San Mateo County had the second-highest median sales price, at $919,000 (up 14.7 percent), followed by San Francisco at $842,550 (up 15.6 percent). 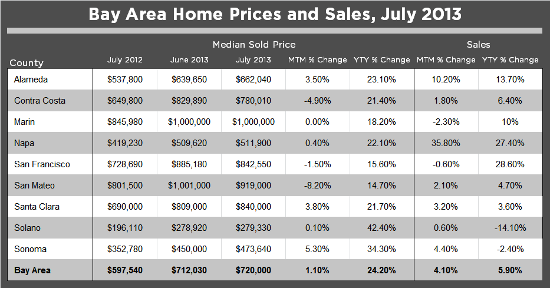 Sales growth was strongest in San Francisco, up 28.6 percent from July 2012. Sales slipped 2.4 percent year over year in Sonoma County and were down 14.1 percent in Solano County. Overall, sales prices in the Bay Area were nearly double that of any other region in California, and year-over-year sales growth was more than three times greater than it was in the Los Angeles metropolitan area. CAR’s numbers support the strong results noted in other recent real estate reports, including Pacific Union’s July real estate update for the Bay Area and the Tahoe/Truckee region, as well as a regional summary from the research firm DataQuick. Leslie Appleton-Young, CAR vice president and chief economist, said the outlook for California’s real estate markets remains bullish. Note that the chart below includes figures for single-family homes, taken from CAR.